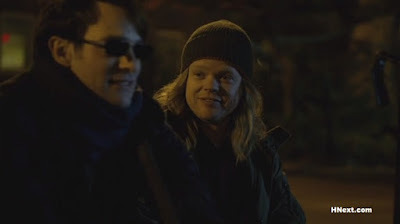 Picking up where we left off from the last episode of Daredevil, poor old Foggy Nelson is caught in the middle of having discovered the extent to which his best friend has been hiding the truth from him. 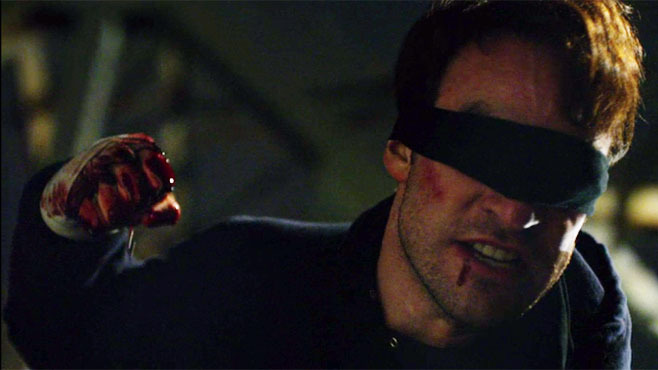 Confronted with the battered and bruised Matt Murdock, revealed to somehow be the vigilante who has been terrorising the underworld despite being blind, Foggy does the only thing he could possibly do: he takes care of him. He calls in Claire to patch up Matt's wounds, all the while torn over how much he can trust his friend - but when Karen rings and Foggy snarls about how she deserves to know, he goes along with Matt and lies to cover his injuries. He doesn't lie very well, but hey, this is Foggy. "Was anything ever real for us?" asks Foggy. And so we take one of several leaps into the past of our comrades-at-law. We learn that Foggy learned Punjabi to impress a girl - we also learn that Matt learned Spanish "to snuggle up to... whatshername... that Greek girl". That'd be Elektra, no doubt. We've already seen how the two first met as roommates in the episode, and we see how Matt has always covered for the whole truth. In a drunken conversation about getting dizzy with booze, he almost slips saying "It's even worse for me because my senses are so..." and then he trails off. Foggy questions him asking him what he means but the moment has passed. But the drunken pledge of "Murdock and Nelson, attorneys at law!" by Foggy is countered by "Nelson and Murdock," from Matt. "It sounds better." As the conversations progress, Foggy learns about Matt's abilities - how he can hear a heatbeat to tell a lie, how he first went into action as a vigilante, seeking to protect a young girl from her abusive father. The truth comes out piece by piece, and that's not always a good thing. As we follow our buddies through times old and new, let's take a quick break away for this episode's geeky references. We've already seen hints at Elektra, and if you don't know who she is then don't on any account watch the movies of that title. Awful. Just awful. Elsewhere in the episode, there are passing mentions on Randolph Cherryh, a corrupt poilitician from the comics. Also mentioned is a chap called Van Lunt - presumably Cornelius Van Lunt, who was the supervillain Taurus and led the Zodiac syndicate. There's a fleeting mention of someone called Richmond too - the only noteworthy Richmond from the comics would be Kyle Richmond, who became Nighthawk and was a member of the Defenders. My mind would boggle if that's anything more than an Easter egg. Lastly, and bringing us back to our friends and their flashbacks, we have a glimpse back to their corporate law days and villainous megacorp Roxxon is at the root of things in the case highlighted. They're a long-standing collection of creeps who've menaced all manner of heroes over the comic book years. "Saying it means it's true." These words aren't spoken as our friends weigh up what they can say to each other, but it certainly has parallels. Instead, the words are spoken by Ben Urich, as he and Karen Page go at her behest to look at a nursing home for Ben's ailing wife. He is on the verge of throwing his hand in with the investigation into the Kingpin, because he needs to pay for his wife's care. Karen prevails upon him to visit a specific home, but on arrival he asks what are they doing there - it's way beyond his paycheck. She urges him to have a look around - and leads him to a room containing the Kingpin's mother. It's good to see Karen leading the way here - she hasn't been wonderfully served all the time as a character in episodes - and the revelation that is uncovered here about how "it wasn't his fault. Wilson just wanted him to stop" reinvigorates Urich and sets him back on the path of the investigation. It seemed as if the Kingpin was back in charge, only for tragedy to strike. At a recetion, the drinks are poisoned. As people begin to collapse, the realisation sets in that something is very wrong, but not before Vanessa collapses into the Kingpin's arms. Episode nine's Devil in the detail here.